Winter riders have discovered cross-country ski trails in Corner Brook to have the most ideal conditions. Bikers are hitting the snowy trails for a trial run. Cross-country trails in Corner Brook are getting new users this winter — and they're on wheels, not skis. Blow Me Down Trails has opened its ski resort to fat bikers Tuesday evenings this winter to allow bike riders with large tires to ride the groomed trails safely. The cyclists say the cross-country ski trails have the most ideal conditions for winter riding on fat bikes, which are bicycles with much larger tires that can push through rough terrain and soft or hard-packed snow. "It's a nice, controlled environment. It's an even surface. It's all groomed," said cyclist Mike Welsh, one of the first to arrive at the trails Jan. 5 for the weekly ride, decked out in a bright red coat, helmet and goggles. "When you're following a snowmobile trail, it can often be loose on the top and hard to get traction. And, you're worried about snowmobiles coming around the corner. Here the surface is reliable, and it's a lot of fun!" 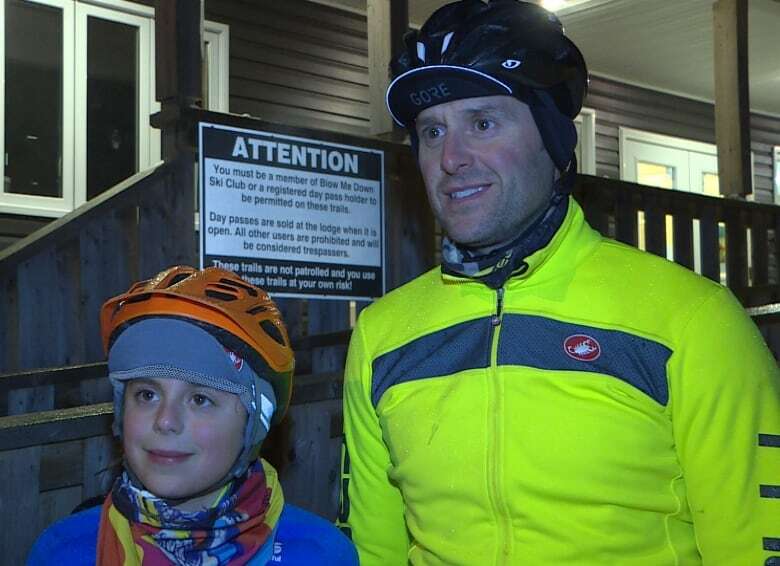 Kirby Hamlyn and his son Reid are avid cyclists who dress in layers and hit the snow, every week. "I like going on a ride with my dad. It's good exercise, too," said Reid. "It's a group ride and we get to do something we are both interested in," said Kirby. "The trails are great. Ideal conditions are groomed trails. 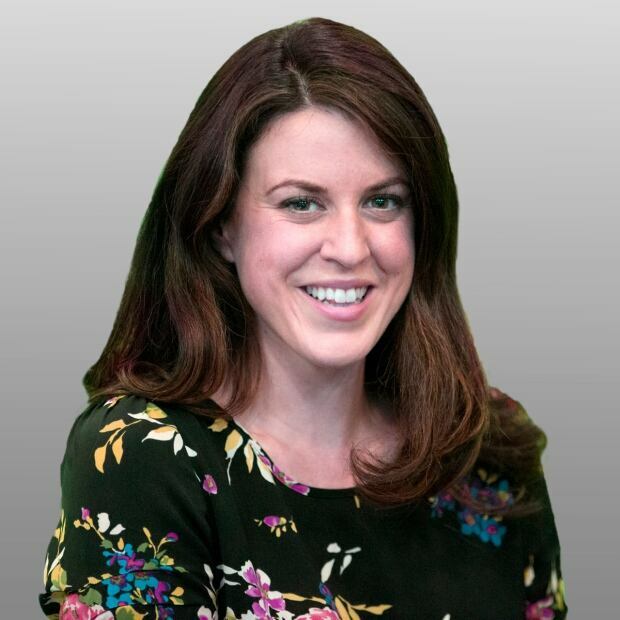 If we can get access to these trails, this is ideal." The group of about 15 riders travel together, all wearing bright colours and head lamps. Blow Me Down Cross Country Ski Club has agreed to allow fat bikers on the trails one night a week for now, but there is a chance trail time could expand. "If it becomes a full-time thing where you can come and ski and bike, It's great. I used to ski," said Kirby Hamlyn. "I could come and ski for a bit and bike for a bit. It gets the skiers introduced to fat bikes and bikers introduced to skiing, so it's a win-win for everybody." Resort general manager Shawn Leamon said the weekly ride is a trial run to see what bike tires do the groomed trails. 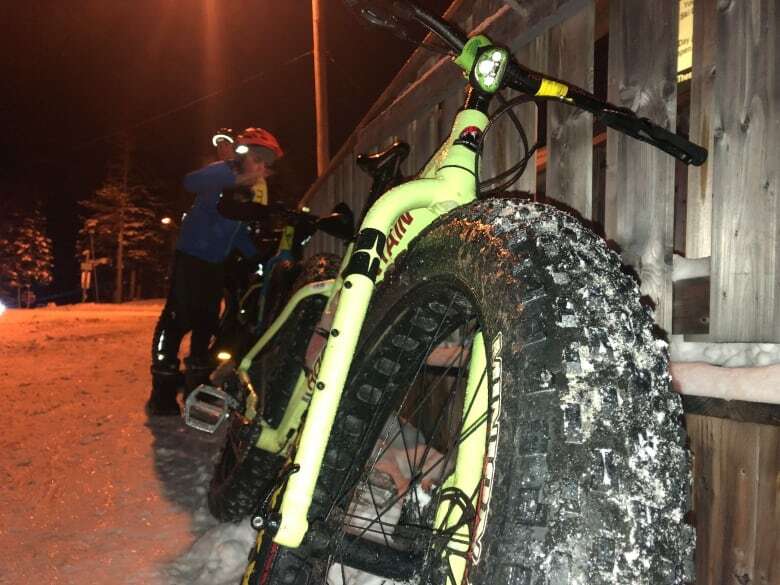 "We are in the business of people having fun but it's a bit of exploration on behalf of fat bikers because it's a relatively new sport to western Newfoundland," Leamon said. "They have been using our outer trails that are not lit. It prevents interaction with our night skiers. We also encourage the fat bikers to follow the etiquette or rules and travel in the same direction of skiers," he said. Leamon says the bikes are not ruining the trails. "It really depends on the weather. Snow conditions make a big difference. Lately it's been that hard. hard snow and it's barely left any indentation. You can see the track but its just the dimpling from the tire. No rutting or anything like that." Leamon says the route is usually groomed before morning skiers head out. The club's volunteer board of directors will evaluate the trial period this winter to determine if riders will share the routes in years to come.